While you might enjoy a day out on the water without having to think too hard about where your lure is in the water, sometimes it helps to know exactly where the fish are in the water. That’s where a fish finder comes into play. 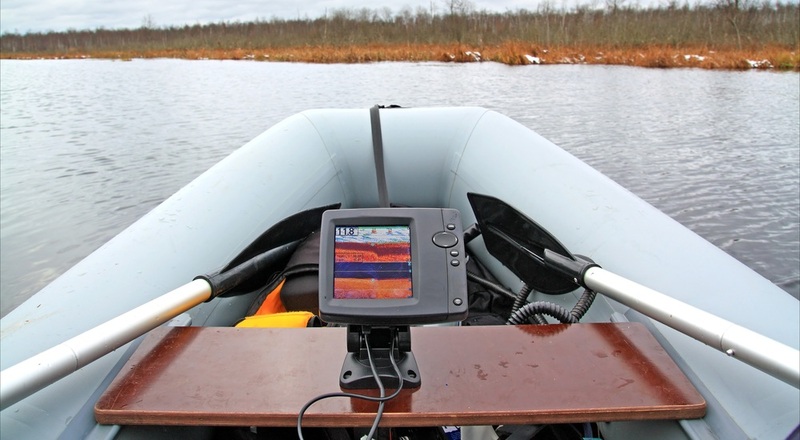 Fish finders use sonar to create an image of the underwater area around your boat so that you can be better equipped to understand where the fish you are looking for are. You will be able to see groups of fish and individual fish out on the water. It can even help you find structures that certain kinds of fish might like to hang out around. This can help you understand the water that you’re in and it can help you fish with a little more efficiency when you’re out on the water. A fish finder can even help kayakers that want to know about the area around them in case they decide to get out of the kayak. In this article, we’ll go over the different kinds of fish finders and what they’re useful for. We’ll also be providing you with a list of our best fish finders that you might find useful. When you’re considering a fish finder, you will need to think about what you’re going to use the fish finder for. Obviously, the fish finder can also be used to help you see what’s going on in the water below you. This can help kayakers that want to go swimming in the water. They don’t want to jump into a shallow area or an area where they could get hurt. But three different types are going to let you see different things. 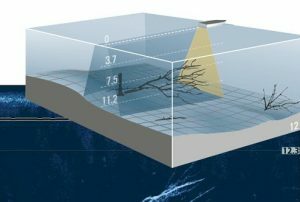 The side imaging sonars are much more useful for seeing the area around you and helping you to get a sense of what the underwater landscape looks like. This is useful for people that are looking for particular kinds of structures for fishing or to check out what’s really going on below them. If you’re really keen to figure out where the fish are, then you might want a down imaging sonar or a more typical sonar. While it can’t show you everything around you, it can give you a sense of the fish right under you. That can definitely be helpful to some people. With the more detailed views, you’ll even be able to see the plants that are growing below you. You will be able to understand what you need the most. You might have to base your choice on what you’re doing, or you might focus more on the price of the fish finder. However, we have options for almost everyone. We’ll be going over the best fish finders out there. One of these will be able to do what you need. If you want to fish like the pros, use what the pros use. Garmin produces a number of amazing quality fishfinders but none that match the GPSMAP series. These high-performance units are simply the best fishfinders south of a true professional charter model. Like those charter models, you get a multi-mode 10-inch display so all of the data you could ever want is at your fingertips. Select from a single view, split-side, of 4-panel view to make the most of every trip. All of this displayed on an HD LED screen designed to be readable in any light condition. Included with this unit you get CHIRP DownVu and SideVu to form the most accurate picture of bottom composition and structure. Depth maps, topo maps, and nautical charts top out the possible views you can choose from. Whether you fish salt or freshwater, this is preloaded with everything you need. The GPSMAP series is Wi-Fi equipped to easily transfer data with other units and BlueChart mobile. Easily store your favorite spots, waypoints, routes, tracks, and any other supplemental maps you may need. You can even expand the unit with other GPSMAP devices like radar to enhance its usability. Easily the best unit money can buy. 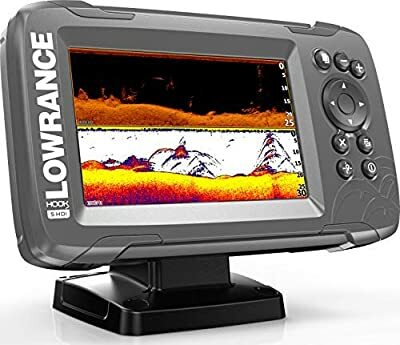 I admit to being partial to Lowrance fishfinders but I have good reason. The Elite series is among the best you can lay your hands on and will put you on fish every time. It is a beautiful blend of advanced technology and user-friendly features that lead to an all-around amazing product. With a high-res, 9-inch SolarMax LED display you have plenty of space to show every view, chart, and map you could want or blow one up to full screen to get the most detail. Combined with the Lowrance Active Imaging software, the sonar views from the dual down and side view transducers, this generates astonishing depth maps. Though it comes preloaded with over 4000 lakes worth of maps with 1-foot contours, using Lowrance Genesis Live you can update that to 1/2 foot contours of the areas you regularly fish. And its all searchable for structure, ledges, drop-offs and the other frequent haunts of big bass. It even has wireless connectivity to share data between Lowrance units without the need for a cable. Grab your buddies best spots or share to the smaller unit on your kayak, this is all a part of Lowrance’s dedication to making fishing fun, expedient, and efficient. 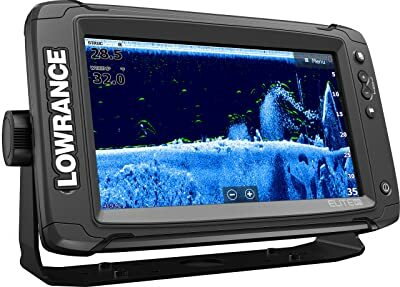 There is no arguing that the Lowrance Elite 9 can take a chuck out of your budget. It is well worth the price but only if you have that money to spend. You can always opt to go a little smaller which can save you a surprising amount of money if you don’t need that big HD display. The Hook2 in a 7-inch display has the same SolarMAX display that can show all of the information the 9inch can. You just loose 2 inches and at this size, that can be a lot. You still have plenty of room to show your favorite charts, maps, and the sonar images but you will find yourself zooming in more often. 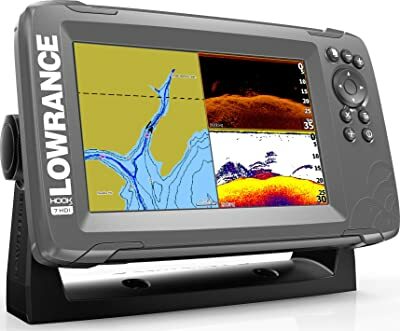 The 7 inch Lowrance unit comes preloaded with all of the same maps as the 9 inch as well as the ability to download other, higher detailed maps. This is still a pro-level tool even if it is a touch smaller. The compromise was never on quality, just the display. Yes, this can still share with other Lowrance units. In this case, this is perfect for a small bass boat while the larger unit serves better for bigger boats. If you end up with both, data can be effortlessly shared between them so you don’t have to remember everywhere you have been. 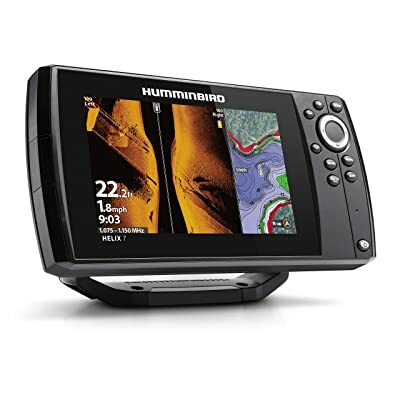 Probably the most well know and perhaps even the highest selling fishfinders on the market have been Humminbird. They were among the first ever made for a wide consumer market and aimed at the recreational fisherman. None of that has changed but the technology has advanced. The Helix 7 is the current flagship fishfinder from Humminbird and leads the way with a 7-inch color WVGA display. This has been optimized for daytime viewing but can slightly washout in the sun. Like most units this size, you can get in close on a single view or show multiple panes for the most information you can pack on a screen. This unit uses a 2d pulse sonar that uses a SwitchFire technology developed by Humminbird to differentiate between the bottom, fish, and structure. This is among the better fishfinders to put you on fish quickly. 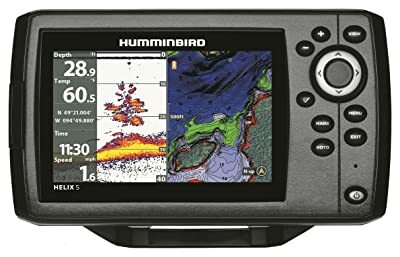 The difference between the higher end models and this Humminbird are immediately apparent. The way the Helix series stores and shows data is much different and can be hard to adjust to. That said, this unit will give you everything you need if you spend the time to learn the display. 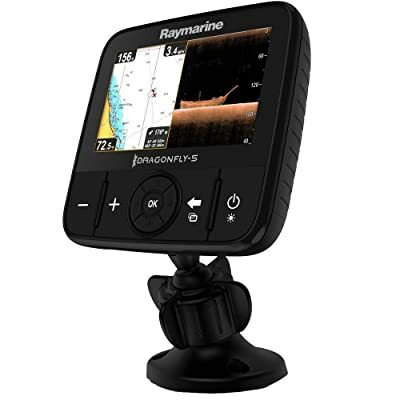 Raymarine makes an exceptional line of marine electronics and has carried that know-how over to the fishfinder market with great success. Their Dragonfly series may not be the most advanced they offer but it is easily at the top when it comes to consumer grade models. Everything a fisherman needs is included and many features you would never expect. Though not as big as some higher-end models, this Dragonfly has a 7 inch HD all-weather, all condition, backlight LED screen. It is big enough to see multiple views using their vertical layering format. Usually, this will make use of a unique Dual-Channel sonar that provides amazing DownVision depth imagery combined with a CHIRP conventional sonar. As far as extras, you get a great selection of preloaded maps and the ability to expand and save data to a MicroSD card. The onboard software combines Navionics and NAG chart for navigation but easily expands to include Jeppsen’s C-Map and Raymarine Lighthouse charts. It does not come with the depth maps for inland waters but still works well as a fishfinder and for navigation. One of the most amazing features of the Dragonfly 7 is its use of Wi-Fi and their own Wi-Fish mobile app. This gives you a heads-up display to points marked on your fishfinder straight on your mobile Phone. Aim your camera and it will show you just where to go. While not necessary, this is a feature you will learn to love and miss if you change units. We have featured both the Hook2 7 and 9 above and while the 5 shares some of their great features, it is a bit of a different beast. The quality is still there along with many of the same features but this unit is made more for the recreational fisherman. In that role, this is a simply amazing unit that stands up to fishfinders costing much more. The 5 inch LCD screen is still easy to read in any light condition but isn’t large enough to do the 4-way split mode used on larger Lowrance units. Instead, it restricts this to two vertical pains that can show modes any of its included modes. Or you can zoom into a single mode for a very detailed display. This fishfinder uses a single TripleShot transducer that includes DownVu, SideVu, and a CHIPR sonar. These give you great fish finding potential combined with bottom mapping and a 300-foot cone on either side of your craft. The views are simply amazing and detailed to show structure, dept, and fish. You get preloaded CMAP mapping of 3000 lakes at a 1-foot contour level and 9000 additional lakes covered with a more standard detail. If you were to pay for this data alone, it would cost nearly as much as this unit alone. When it comes to value and performance there is simply no fishfinder that comes close. The Dragonfly Pro in a 5 inch is just the smaller sibling of the 7-inch model above and has every feature in common but with a much more convenient, small package. 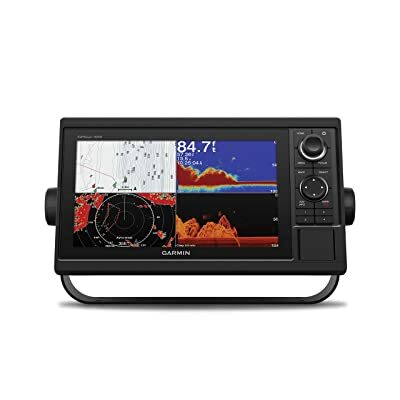 Perfect for smaller craft and kayaks, this fishfinder is both popular and highly rated among those fishing smaller inland waterways. At a 5 inch screen, the overall dimensions have been slightly changed to give you a side-by-side view or select a single mode for full detail. This is still the same amazing HD LED screen with a backlight and daylight readable technology. In small fishfinders, this display is actually quite phenomenal with amazing color and anti-fog coating. The Dragonfly 5 uses the same unique dual-channel CHIRP DownVision sonar combined with a conventional CHIRP for spotting fish. This gives you great bathymetric views for structure and depth while preserving the ability to get a great reading of fish. This is a successful combination in a tiny unit that works out perfectly for lakes and rivers. Yes, this unit does come with the Wi-Fi and Wi-Fish app that allows heads-up navigation to your favorite points. This amazing add-on works great with the onboard storage of up to 3000 waypoints and 15 tracks of your favorite fishing areas. You can expand and share this storage using a MicroSD card. 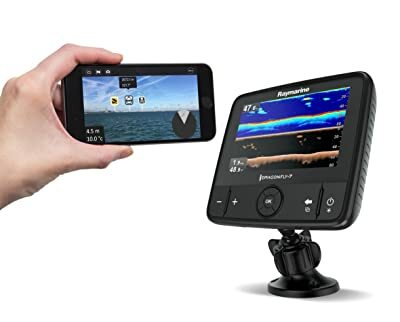 When it comes to the top-selling fishfinder for the Average-Joe fisherman, we come back to Humminbird. This is a widely and successfully advertised model that stands up to hype enough to stay popular in the modern market. It may lack features common on high-end models but if those are not needed, you can save some serious bucks with this model. It should not sound like this is a base-model unit, it is quite a bit more than that. Unlike cheaper models, this does have a full color 5 inch HD WVGA display that is readable in any light. This is a perfect display for all of the included options and data this fishfinder can display. Even as a more budget model, this still comes preloaded with Anima maps and internal GPS plotting for easy navigation and waypoint creation. You can load additional maps using the MicroSD slot if you don’t get enough. You can track, save, and export all of your favorite locations or import data from other units to check out great spots you may have missed. With a Dual-Beam CHIRP PLUS sonar, you get amazing fish finding potential and can make out structure and other features with a little practice. These are not the most intuitive units but they do work quite well, especially on smaller water. It may be missing some highly desirable features but when money is tight this will do way more than just get you by. To start, we should really talk about how different fish finders work. There are three different types of imaging. They range in accuracy and purpose. They are all based on a sonar system to create an image. Their accuracy and the kind of image that they create depends on the type of sonar that they are. There are pros and cons to each type, which is why they are useful for different things. The first kinds of fish finder are very simple. A cone of sonar is beamed down into the water. The sound that bounces back creates a rough idea of the water below. With the standard sonar types that were first used in fish finders, you see arcs where fish are. The problems with the standard sonar are that they aren’t usually extremely accurate. They have become more sophisticated over time, but these sonar types are still rough. They aren’t always capable of showing an accurate readout of the depth, but for finding fish they can work quite well. Because they aren’t that detailed on the screens, it takes a little bit of time to understand how you’re supposed to read them. Once you get the hang of it, though, you’ll find that they can be quite useful. Down imaging is the more sophisticated version of the traditional sonar types. There are many different names for this more sophisticated imaging system, and it will largely depend on the brand of fish finder that you are looking at. The long and short of this is that the image is actually much closer to a real image of what’s down there. Instead of seeing simply where the sound bounces back, your sonar will be able to use that information to create a clearer picture of the water below you. This means that the technology is a little more expensive, but it can make seeing what’s going on a little easier. 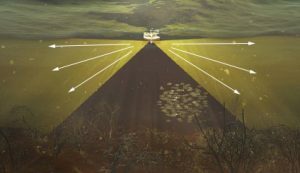 Instead of your sonar getting stuck on a field of weeds below the surface of the water, you’ll be able to see that there is a field of weeds. Being able to accurately see the water below can help you understand where the fish are hanging out. The downside of this imaging type isn’t just the price, but the time that it will take you to learn and understand this technology. However, fish finders that contain a more accurate sonar system will also often have a more typical sonar set up as well that you can toggle between. That’s a pretty nice system to have. Side imaging is much different than the other two types of sonar. This one focuses on sending beams out to the side. You will be able to see less of what’s right below you and more of what’s out around you. This kind of sonar is particularly useful is you are looking for structures around your boat. It also widens where you can see. Instead of only seeing down, there is a radius that your sonar will be able to sense. 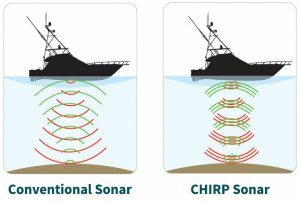 There are side imaging sonars that are sold separately, but you will also find the technology bundled in with the other two types of sonar. Side imaging can work well on its own, but it works extremely well with the other types of technology behind it. It is also a little bit more expensive and harder to install than the others because of where the sensors need to be. There are always exceptions to this rule, but it’s just something to keep in mind. When it comes to improving your fishing game, the best way to improve your time is by adding a fish finder. The machine, regardless of how sophisticated or expensive, will allow you to really get a better idea of what’s going on below you. You’ll be able to be more confident in the water and come back with more fish to eat. However, keep in mind what you’re looking for in a fish finder. 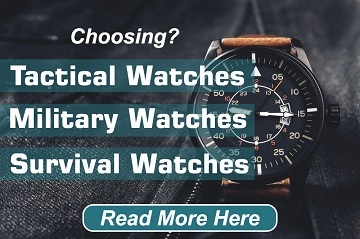 There are a lot of options out there, and we’ve covered some great ones here. Consider what you want from your fishing experience, and then move on from there. Hopefully, we’ve given you some great advice that will help keep you at the top of your fishing game. I personally like Lowrance HDS-7 than others. It’s fast and amazingly easy to operate. You may want to review it someday. Hi that’s a great post about fish finder. Personally my choice is Garmin Echo, but you have discovered new things. Thanks for your true effort. Raymarine Dragonfly 7 Pro a very successful product…thanks sammy. Almost all of these models were obsolete in 2018. Most of these are not even in production anymore…. Hi Sammy, I’m using Humminbird Helix 7. i can recommend it to professional fishermen.